Training the trainers has been the first, fundamental step in the implementation of the FOODBIZ project titled University and business learning for new employability paths in food and gastronomy. Designed under the umbrella of the action on Strategic Partnerships for Higher Education of the Erasmus+ programme, the project addresses the compelling challenge of strengthening higher-education students’ employability to balance the current disparity existing between their academic knowledge and skills and the real needs of businesses and entrepreneurs working in local food and gastronomy markets. The FOODBIZ Training Week took place in Opatija, Croatia from 14-18 May 2018 and involved academic staff from the four European universities participating in the project: the host of the event, the Faculty of Tourism and Hospitality Management, University of Rijeka (Croatia); the University of Macerata (Italy) whose team is coordinated by IGCAT Expert and Professor at the Department of Education, Cultural Heritage and Tourism, Dr. Alessio Cavicchi; the University of Gothenburg (Sweden); and the University of Economics and Business of Poznan (Poland). Research Assistant, Fabrizia Toccoli attended the event on behalf of IGCAT, together with representatives from the other partner institutions contributing to the FOODBIZ project: the Piceno Lab of the Mediterranean Diet (Italy); the Svinesund Committee (Sweden); and the European Cultural Tourism Network (ECTN), based in Brussels. The aim of the Training Week was to provide university staff with relevant resources and tools to develop workshops in their own regions, engaging university students and local food businesses. With the objective to enhance students’ employability and entrepreneurship, the workshops are conceived to facilitate cross-sectoral cooperation and multi-stakeholder dialogue, in order to identify specific needs of all actors involved and design bespoke learning materials that respond to those needs. The first output of the project, FOODBIZ Handbook was presented as a how-to guide for universities to organise local workshops. Drafted by the team of the University of Macerata, the document excellently outlines FOODBIZ methodology, based on the concept of co-creation, and proposes a range of different possible methods that can be adopted to generate co-creation processes: open space technology; appreciative inquiry; design thinking; and the entrepreneurial discovery process. Co-creation methods are intended to facilitate active participation of all players, identification of existing strengths and related opportunities, experiential learning, and creative problem-solving. Thus, contributing to the ultimate goal of tackling local challenges through the co-creation of innovative solutions which are tailored to each specific regional context. Workshop activities will complement students’ academic knowledge, providing them further assets in terms of know-how, experience, hard and soft skills, and transversal competences to be spent in the food labour market. 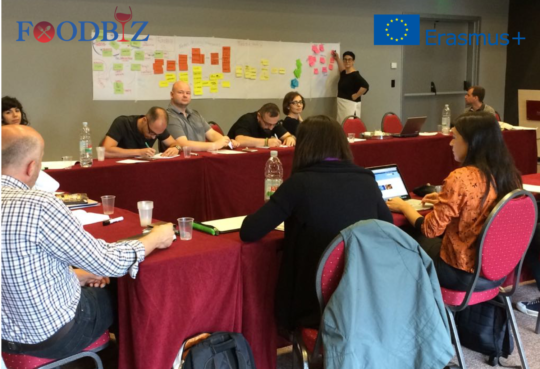 In the framework of the Training Week, the second FOODBIZ Project Meeting took place, where partners assessed current situation and set important milestones for future development of the project. IGCAT is in charge of drafting FOODBIZ final guidelines, that will facilitate future replication of the initiative into further contexts, and contributes to the dissemination and promotion of the project’s progresses and results. IGCAT is a non-profit institute established in 2012, working with regional stakeholder consortiums in the fields of gastronomy, culture, arts and tourism. It counts on the expertise of a worldwide network of experts and works in partnership with specialized intergovernmental organisations. IGCAT provides the Region of Gastronomy Award and is the official secretariat for the European Region of Gastronomy Platform. Furthermore, the Institute has developed the European Young Chef Award, the Local Food Gift Challenge, the Top Food Experiences of the Year, and the Food Film Festivals project.